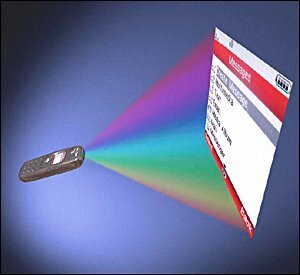 I'm a couple of weeks late with this news, but apparently we are inching closer to having mini-projectors in our pockets. The Korea Times wrote about a company called Iljin Display that demonstrated a prototype of "a coin-size laser video projector module that can fit into portable gadgets such as mobile phones and digital cameras. The smallest of the demonstrated prototypes was about the size of a packet of cigarettes, and the company explained that it could be reduced to the size of a matchbox by the end of the year. Using the technology, users can project photos and video images on the wall from the built-in projector, making a seven-inch, full-color screen." Also watch Light Blue Optics that released their evalution kit to manufacturers earlier this year.